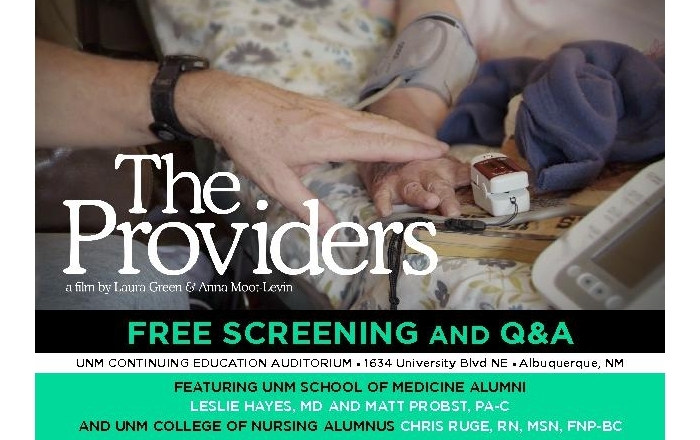 A free screening of the award-winning documentary “The Providers” will be shown on Thursday, Jan. 17, at 6 p.m. at The University of the New Mexico Continuing Education Auditorium, 1634 University Blvd. NE. Doors open at 5 p.m.
“The Providers” follows UNM School of Medicine alumni Leslie Hayes, MD, and Matt Probst, PA-C, and College of Nursing alumnus Chris Ruge, RN, and their work at El Centro Family Health, a network of clinics serving a 22,000-square-mile area in northern New Mexico. The providers will participate in a question-and-answer session following the screening. The film focuses on the cities of Las Vegas and Española and shows the challenges the three providers face in serving a region hard-hit by the opioid crisis that has difficulty recruiting medical professionals. The film was directed by Laura Green, a San Francisco-based director and producer, and Anna Moot-Levin, a New York City-based director and producer. “The Providers” is the first feature-length documentary for both. The film debuted at the Full Frame Film Festival in Durham, N.C., last April and has been shown around the country, including at the Santa Fe Independent Film Festival last October. It is also scheduled to be shown as part PBS’s documentary film series “Independent Lens” on April 8.